AD-17/C-1512 is a wideband V/UHF discone omni antenna, operating over 100-512 MHz frequency range, at up to 500 W CW, ideal for tactical and fixed site use. AD-17/C-1512 is a wideband omni antenna with flexible elements, intended primarily for portable tactical use. 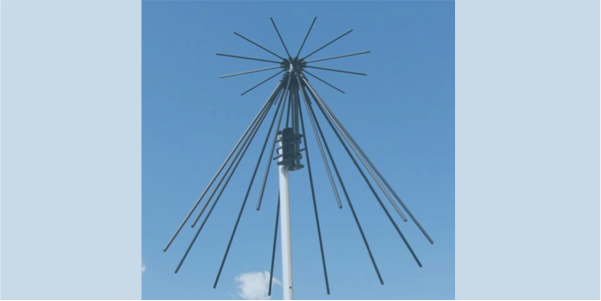 The discone antenna is composed of a support head/hub with 12 disc and 12 cone elements made of high-grade irridite-coated aluminum. It handles up to 500 W CW with stable VSWR and omnidirectional radiation pattern over the entire frequency range. Check out our big selection of AD-17/C compatible masts.